After his 2015-16 campaign was limited for the final month due to injuries, Robert Johnson returned to full health in his junior season. Johnson had offseason foot surgery that limited his ability to work out in the offseason, but the Richmond (Va.) native was deemed 100 percent in the fall and started 32 of IU’s 34 games. 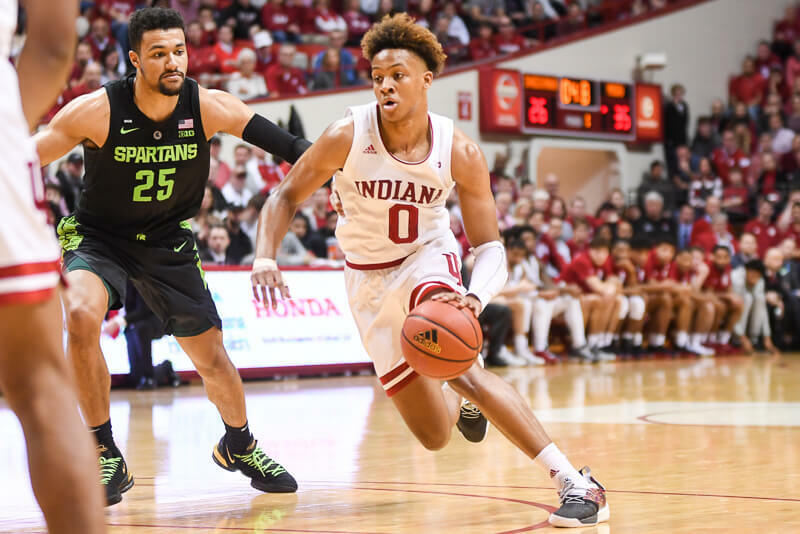 The 6-foot-3 combo guard finished the season as Indiana’s second leading scorer despite a rough six-game stretch late in the season where he scored in double figures just one time. Although his overall efficiency numbers dipped as his usage rate grew by 4.3 percent, Johnson showed improvement in a few key areas in his third season. His turnover rate dropped by 2.2 percent, which isn’t a huge number, but is notable given the fact that he had the ball in his hands more often. His free throw percentage also improved by more than 11 percent and his 2-point field goal percentage also improved by more than eight percent. He also shot 37.6 percent on 3s in Big Ten games, which was up from 36.2 percent as a sophomore. 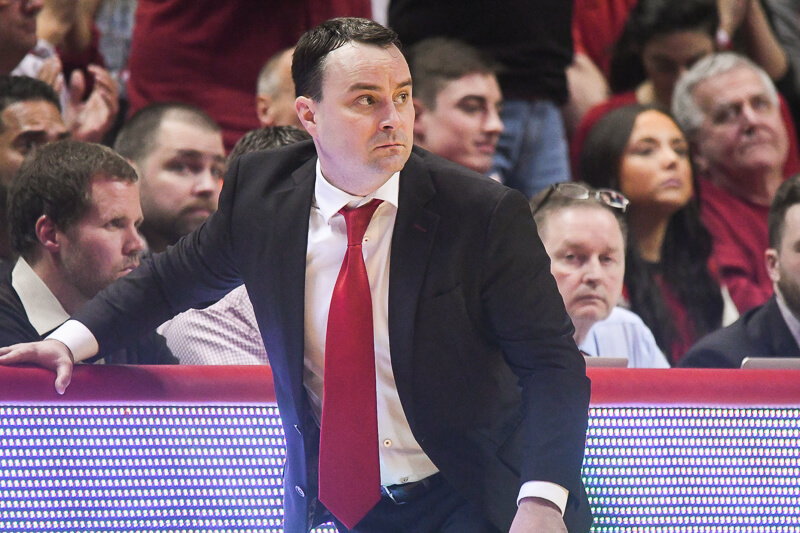 After a 27-point performance in a triple overtime win over Penn State on Feb. 1, Johnson’s final month and a half – much like Indiana as a team – was up and down. His 26 points, six rebounds and six assists were a major reason the Hoosiers won at Ohio State on March 4. That performance was arguably his best of the season as he hit five of his nine 2-point attempts and five of eight from behind the 3-point line. But there were also some head scratching performances the final month of the season, including going scoreless in a loss at Minnesota and just two points in 33 minutes in IU’s NIT loss at Georgia Tech to conclude the season. Johnson recently announced that he will enter the 2017 draft, but isn’t hiring an agent. That declaration will give him the opportunity to get feedback from NBA teams and also workout while also leaving the door open for a return next season. At this point, he isn’t on any draft boards and isn’t expected to be invited to the NBA draft combine next month in Chicago. 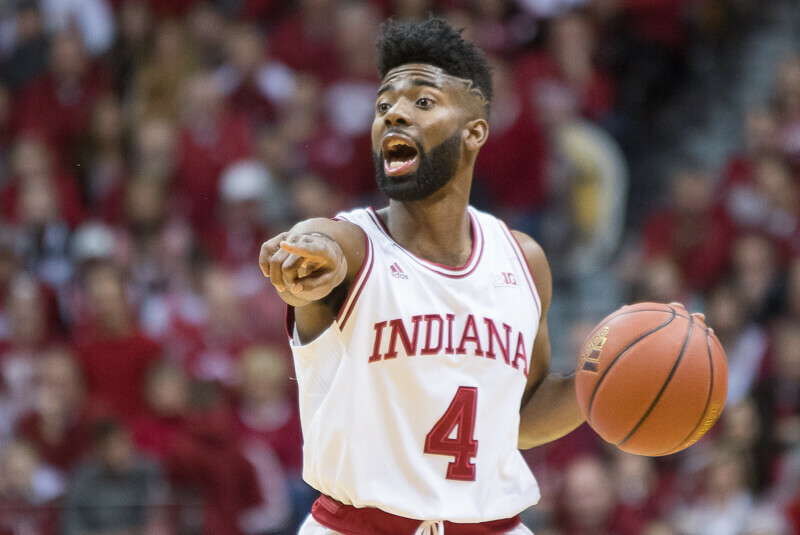 Assuming he returns, Johnson will have a chance to surpass the 1,000-point career scoring mark early next season and will also be one of the most important pieces on Archie Miller’s first Indiana team. Bottom Line: The departure of Yogi Ferrell opened up the opportunity for a larger role offensively for Johnson as a junior and his scoring production grew in his third collegiate season. Johnson made the no risk decision to test the NBA draft waters without hiring an agent, which should help him receive valuable feedback over the next month. With a full offseason to work on his game, he should once again be one of Indiana’s most reliable players as a senior. 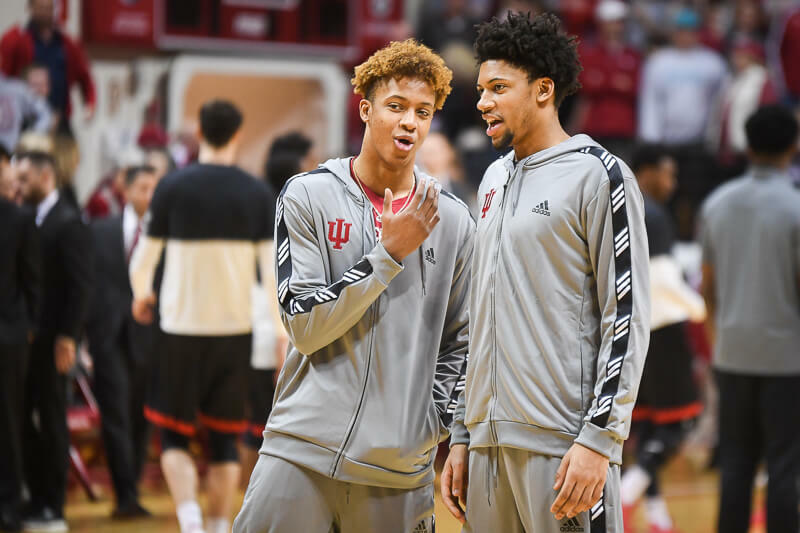 As one of Indiana’s best defenders since arriving on campus, it will be interesting to see what kind of progress he can make defensively under the new coaching staff if he opts to return. Quotable: “I think my teammates did a good job of finding me and getting me involved early. And I just wanted to come out aggressive and attack. I think I was just in the flow of things, offensively and defensively. I think I had the right mindset from start to finish today and that helped me make shots.” – Johnson following Indiana’s win at Ohio State on March 4. He is going to make a big step forward next year. I think Archie is going to simplify the offense more and let these kids’ natural abilities take over. I feel like Crean’s system was too complex and our guys tried to think too much instead of just playing. Rob lad..we want ya, we need ya.. and we love ya! Come back and be the senior leader IU lacked this past season/. I hate spreading rumors or non-factual information, so take this with a grain of salt and just realize it’s one person’s opinion. But I think there was something just a little off last season that affected the players performance. There was a lot going on and CTC was really on the hot seat as that losing streak drew on-and-on. I think it’s like they didn’t think they would win … so they didn’t. I could be all wet, but I’ll stick with thinking that something was off. With the regime change, I’m hoping that a breath of fresh air will clear out all those cobwebs and get those guys to play like they can. Wouldn’t that be something! They (most anyway) seem to have developed a good relationship with Archie, the lack of defections so far has shown that, so I’m hoping for the best. And the best would be for RJ to return for his senior year. I just really think that he would be a force for IU! I truly believe that, if an NBA team thinks RJ is a prospect in next years draft, they might as well, get him now! Not saying that he won’t get better with another year of college, just saying that he will only be a few percentages better maybe. RJ had an up and down season, however mostly, due to mental issues. Not sure what was the cause.. However, other than that.. RJ is pretty consistent player! I think he could play in the NBA. I agree, seems like the team quit playing for Crean. Agreed RJ is a good player and would love to him back. As far as something being off last season, I think we’ve all hashed that out already. No one will disagree with you. If he can cut some of the most egregious turnovers I’ve ever seen from any player (Fort Wayne game had the ball stripped twice while he was holding it calling a play, but by no means his only mental lapses of the season)(atleast when Troy did a Troy thing he was being aggressive trying to make something happen) out of his game he will be a good piece to have with the transition. If he doesnt get better with turnovers while also becoming more aggressive he would be better off coming off the bench I think. Hmmm. I’d have to go back and check his game stats against the time when our losses starting to pile up. The way I remember is that the real, genuine, serious hot seat talk really started in unison with RJ’s shooting slump. It was the straw that broke the Crean’s back, if you will. So I’m not sure what came first, the slump or the hot seat, leaving aside the crazies that had him on the hot seat since Syracuse. On paper there aren’t too many Big Ten, highly rated recruits that’ve already been 3 year starters headed into their senior year. When Rob is “on”, he’s as good as there are in my opinion, definitely NBA level talent. He just disappeared though mid season so I imagine consistency will be his challenge coming out of NBA evaluations. Really, he’s got all the tools; size, skill, defense, shooting…would LOVE to have him back. I think it would be pretty exciting as a guard to consider playing for a scrappy point guard coach. We just have to hope his slump was just that and he will regain his stroke next year in an IU uniform. Something happened to his confidence and focus last year for sure. I remember Alford going through a stretch like that too. I think just about everyone loves RJ and wants to see him have a great Senior year. There is a point where the players lost confidence in the coaches and how they were playing. Not sure if it was the outside noise, the strange coaching using signs on the bench or what. Unfortunately, when that starts to happen, it is very difficult to turn around. Rob probably more than any other player seemed to be impacted by this. It wasn’t just his shooting but his whole game seemed off. I wish we had him for two more seasons as this next year is going to be a tough transition for the upperclassmen. I hope he comes back but am worried that he might be ready to move on. I like RJ as a player. He can score and plays defense. I think there was not enough ball movement due to horrible offensive scheme for him to thrive. Obviously all those players committed too many turnovers as has been the case will all crean teams. Lacking a true point guard hurt the shooters opportunities. Too much isolation and having to get their own shot, which meant late shot clock chucks from three that were usually strongly guarded. I also think when crean called out the juniors, he took it too hard personally and seemed to regress. It seemed he was afraid to shoot at that point. Thinking about it, I believe you’re right. The coaches seemed to treat the players like they were dumb, so they acted dumb……………perhaps. I think you are right. But RJ had that shooting slump which is just something guys go through sometimes. But that was a pretty severe one. RJ is badly needed at IU next year. He’s still got work to do. Everybody gets knocked down, but not all can get up again. RJ has taken the battering…it’s his time to shine. How great would it be to have some seniors steward the program into a new era, and do it with toughness and panache? He’s gotta come back. In fairness to the coaches, the players kept doing things the coaches told them not to, so the signs were a last resort. Exactly right. And I just don’t understand why that was going on. That’s what I mean … something was going on in the background that we don’t know. I really try to avoid wild speculation, but I just can’t figure out what was happening between the coaching staff and the players. Seems like an ‘chicken or the egg’ thing! I think we will know sooner than later regarding RJ. He isn’t likely to be invited to any of the workout camps so after he gets some feedback it will be time to let us know what he wants to do. Can anyone confirm whether he has graduated or not. Seems like both stories have been suggested.